Socal Safe are your cash automation experts. Let us help you implement the most efficient solution for your cash handling needs. We have one of the most extensive inventories of cash automation equipment in the country, and our experience makes Socal Safe the right choice. Call (800) 334-6060 toll free today to reach one of our security experts. 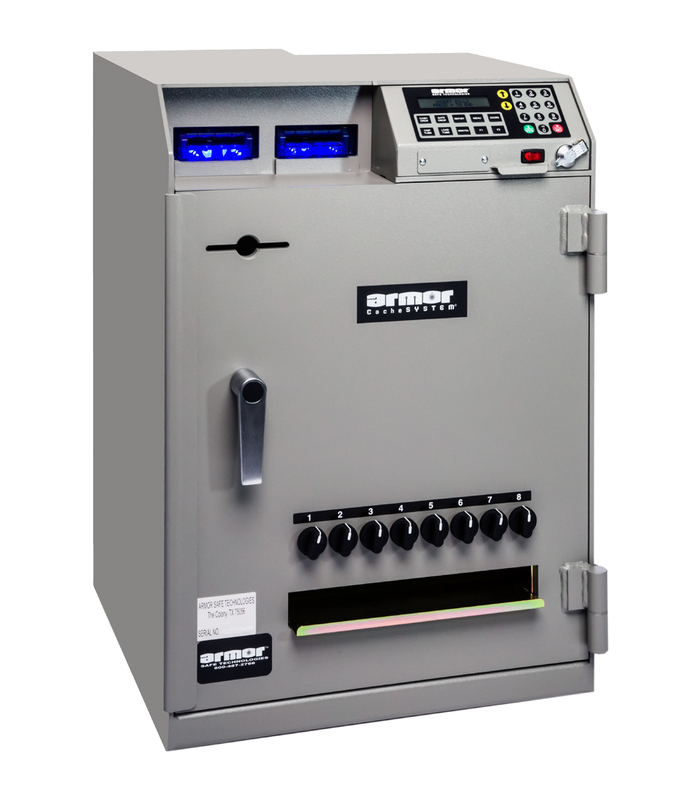 The 7000 Series Smart Safe provides the ultimate level of cash control by limiting cash exposure and providing seamless accounting between the POS and your bank. It offers the combined benefits of cash-counting and bill validation with change-fund management and an audit trail of all transactions. Once your cash is placed in the safe, you can rest assured it will stay there. Our products are designed and constructed to rigorous standards to protect each point of access and reduce your risk of robbery. Each safe is equipped with casino-quality bill validators that provide the highest level of first time bill acceptance and unsurpassed counterfeit detection. Counted funds are secured in cassettes for easy transport and deposit. This series may be fitted with one or two validators. Our vending magazine is simple to load and count. The inner view provides a visual count of inventory without a dipstick. Every transaction is recorded and tracked through each user’s personal identification number (PIN), providing a seamless audit trail. More than 30 different types of receipts and reports can be printed on the system’s high-speed printer, including end-of-day activity, cash removal, and individual user reports. The 7000 Series Smart Safe integrates effortlessly with application service providers, allowing real-time access to analytics and transaction data remotely or from the back office. The 7100 units are full-featured cash management tools that may be configured with one or two bill validators. Deposit cassettes and change funds are accessed through a single door in the main com-partment, which has additional storage space for cassettes, lottery tickets, or other valuables. 23 3⁄4”W x 20”D x 31”H, approximately 475 lbs. The 7300 models provide the benefits of the 7100 model within a narrower footprint, allowing users to replace legacy change dispensing safes with a complete cash manage-ment solution. The 96-tube vending capacity and locking inner cassette door make the 7300 the smartest safe for customers with limited space. 20 7⁄8”W x 20”D x 31”H, approximately 425 lbs. Ideal for cash intensive businesses, the 7900W maintains high levels of cash security in a single safe, while reducing the risk of theft and robbery. This two door model incorporates up to four bill readers, two of which are locked in a separate compartment that can only be accessed under dual control. 30 3⁄4”W x 20”D x 31”H, approximately 600 lbs. Every Smart Safe is accompanied by a standard one year parts and labor warranty. Extended warranties are also available. Receive free 24/7 phone support for the lifetime of your safe. Included is a comprehensive user manual and quick reference guide to get you started.